Reports of taxi drivers telling passengers to remove poppies before they will accept the fare has led to a Weston firm promising to sack any employee who is prejudicial against the Remembrance Day symbol. Social media has been abuzz with stories of multiple Apple Central Taxis’ customers being asked to take off poppies – allegations, which although unproven at this stage, have led to company cars being smashed and verbal abuse aimed at staff. The Royal British Legion (RBL), which co-ordinates the poppy campaign, said Apple taxis is – and always had been – a supporter of the appeal and urged people to remain calm. The Mercury has been told of two occasions where customers were allegedly asked to remove a poppy, one on October 26 and another on October 30. One of the customers described the driver’s stance as ‘disgusting’. Apple taxis’ general manager Steve Tedd stressed it has no anti-poppy policy but said unless someone comes forward officially with a time and date, it cannot discover if the rumours are true or dispel them. The allegations – which led to Weston’s English Defence League branch calling for a boycott of Apple taxis – have provoked revenge attacks. Mr Tedd said: “A couple of drivers have had car windows smashed. We also had a soldier on Saturday afternoon walk into our office, having heard the rumours and was angry, and wanted to talk it out with our telephonist. Thankfully after half an hour it ended peacefully. North Somerset Council, which issues licences to taxi drivers, has not received any complaints in relation to the alleged incidents. 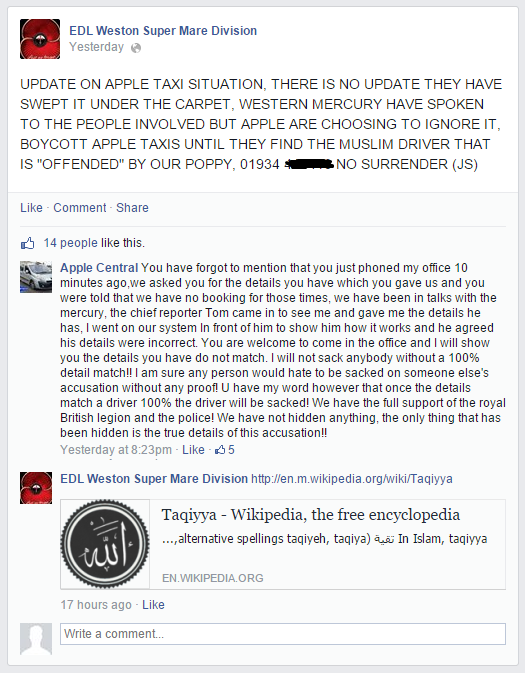 You’ll note that the EDL campaign against Apple Taxis is being promoted by one “John Sheridan”. This is a pseudonym adopted by a former British National Party member named Chris Renton. 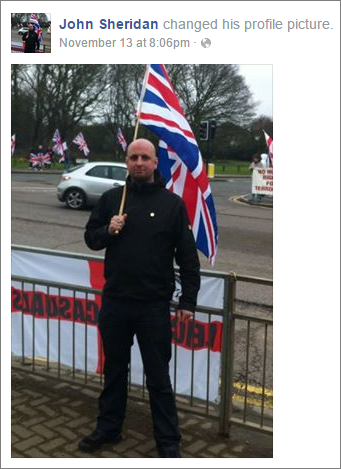 Having helped to found the EDL and set up its website, Renton left the organisation and subsequently launched a rival far-right group, the paramilitary English Volunteer Force, before returning to the EDL. This entry was posted in Anti-Muslim violence, English Defence League, Far right racists, Resisting Islamophobia, UK by Bob Pitt. Bookmark the permalink.